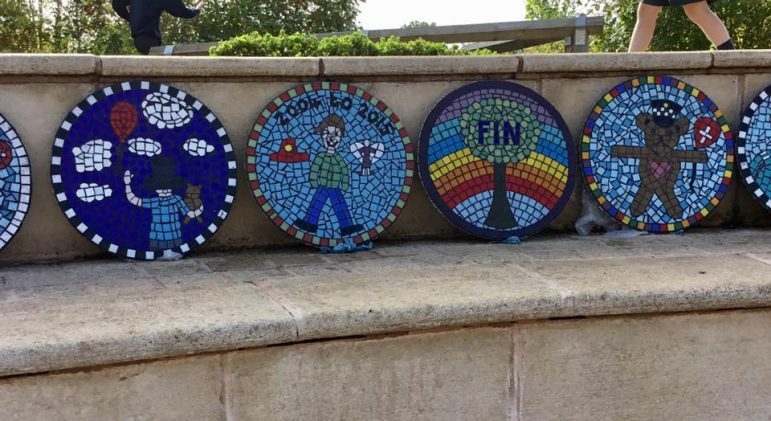 A MOSAIC garden has been created at Alvechurch Middle School in memory of brave 11-year-old Finlay Church who lost his battle with a brain tumour last November. Despite his struggles, he and the Church family led a fund-raising drive for Birmingham Children’s Hospital, where he had a lot of his treatment, and for the Brain Tumour Research charity – collecting more than £100,000. Fund-raisers have continued the campaign in his memory with the total now standing at £140,000. He became well-known for breaking the longest line of teddy bears Guinness World Record, notching up 15,534 in a row. His family also undertook another attempt on what would have been his 12th birthday – the longest line of hats – which reached 5,471 and again became a World Record. Fin also won the Child of Courage accolade at the Pride of Birmingham Awards last year. Local artist Jackie Nash has been so inspired by achievements and deeply saddened by his story she wanted to pay her own tribute. “This tribute grew into a large memorial garden which I designed using the children’s drawings. She funded the garden and enlisted the help of her husband – builder Elliott Nash who gave his time for free. They also had materials donated by EH Smiths, Webb’s and Tilemaster Adhesives. Some of the children at the school who knew Finlay, designed 22 stepping stones which now line a long pathway leading to the main garden. Jackie part-made the stepping stones and then took them into school to finish them with the children and worked with Fin’s family to design the central mosaic which went in the middle of gravelled angel wings that the children designed. 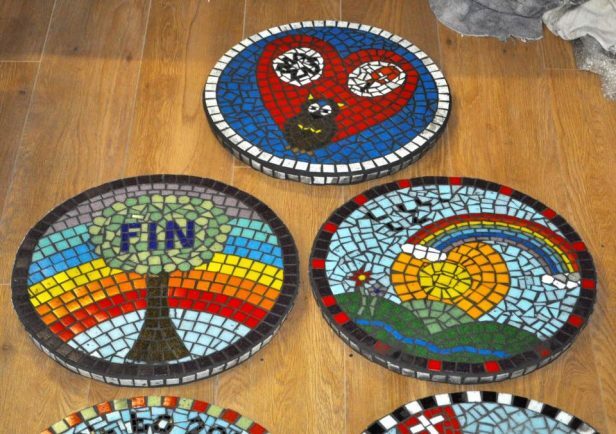 Fin’s family designed each of the mosaic segments with images and words which conveyed how they remembered Fin. The middle of the central mosaic is bright orange – Finlay’s favourite colour. Hannah Gedders worked with the children and helped them select the perfect plants to go in the garden, along with the planting of the chosen varieties. The garden will be unveiled tomorrow (Friday) at a private ceremony at the school. Fin’s mum Penny Church said: “I’d like to say a big thank you to Jackie for all her hard work and giving up all the time it took – it ended up being on a much bigger scale than we thought it would be. It’s absolutely amazing. “I also want to thank Hannah for everything she’s done and all the businesses which have supported the project and donated materials. “It’s so lovely that all the different classes have been involved and us as a family as well. Visit https://www.facebook.com/Finlaysjourney and www.finlaysjourney.com for more on the fund-raising in memory of Fin.